David Thomas Moran participated in TrIP Phase One on November 1st. 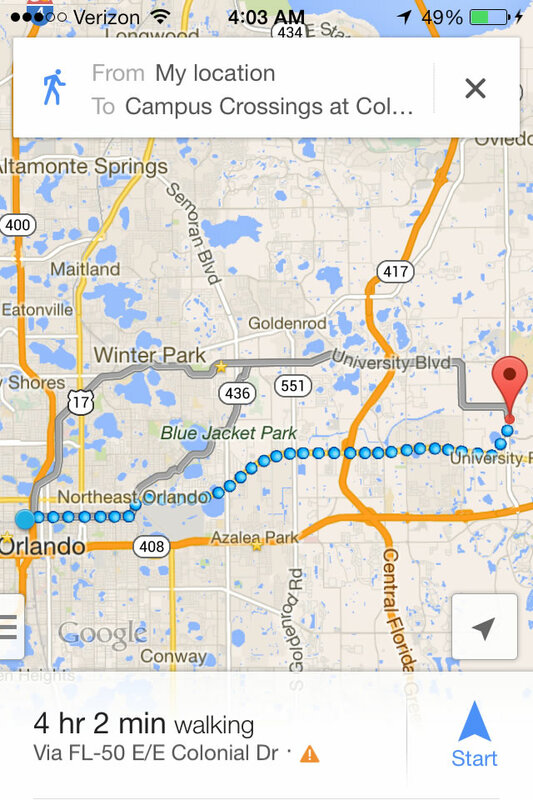 Google Map directions for walking from Parliament House towards UCF. The trek home took two hours longer than expected. A voice for LYNX riders. As a graduate student whose livelihood has depended on the LYNX bus system over the past two years, I find much hope in the Transit Interpretation Project (TrIP). I’m beyond thrilled to see such a diverse and creative group of individuals intentionally engaging with LYNX. I look forward to witnessing how TrIP collectively raises Orlandoans’ consciousness of the bus system and gives voice to an often overlooked and misunderstood sphere of public life in the region. Some might say that “nobody rides the bus” but actually many people do. It’s just statistically must smaller than the number of people who commute by car but not any less worthy of a voice. For me riding the bus is not a novelty or a chance adventure…it is a difficult reality. My contribution to TrIP is based on my personal experiences with LYNX. I do not intend to speak for anyone else because I realize that we all have differing circumstances, but I imagine that there are some common threads of experience that more than a few LYNX riders might relate to in regards to what I have to say about busing around O-town. Surviving the LYNX bus system. At best, I would describe the bus system in Orlando as exhausting, hard work to navigate but sometimes relaxing and helpful to ride. At worst, I would say riding the bus severely impairs its riders’ abilities to function in society. It can be a daunting, if not impossible, task to just accomplish day-to-day activities and errands using LYNX whether it is going to work, school, the doctor, daycare, the grocery story, etc. As a LYNX rider, I’m pretty angry. I have felt isolated, left behind, ignored, disregarded, etc. I try not to be a victim of these circumstances but riding LYNX can feel overwhelmingly victimizing whether it is waiting at a bus stop with no shelter or even a place to sit along a busy highway in a torrential downpour for a bus that only comes once an hour or desperately trying not to get stranded when you work late at night because the majority of buses stop running around 11pm and you can’t afford the outrageous cab fares or the endless hours of waiting for transfers or late buses or navigating poorly designed bus routes that regularly double, triple, quadruple or more standard car commute times. Lack of support for public transit in Orlando. The issues I believe is less LYNX itself but rather a pervasive lack of support for LYNX and its bus routes by local political leaders, businesses and a large segment of the Orlando population. As people continue to choose not to get on the bus, the bus system’s functionality remains stuck in an arrested development. Moving forward. On a more positive note, I am grateful that Orlando even has a bus system, and I think LYNX has so much potential to be a viable mode of transit for a vast cross-section of Orlandoans. LYNX simply lacks the public support and dedicated funding to make this happen. I don’t doubt that Orlando has the potential to be a world leader in public transit and it’s high time Orlandoans embrace such an opportunity. Cars are not the only future, multiple effective and efficient modes of mobility whether walking, biking, driving, busing, riding rail, etc. are the future. We are on the cusp of a more sustainable, accessible and mobile way of life for all Orlandoans. TrIP Phase One is only just the beginning. My contribution to TrIP pulls mostly from my personal experiences of being stranded by the bus system because of its limited operating schedule. @deadquarewalking is a documentary photography series and performance art/game-as-art installation in which I documented my experiences commuting by bus and walking to/from a local gay club (the Parliament House Resort) on Halloween. Since the bus doesn’t run throughout the night, I walked from Parliament House back to my apartment in the UCF area which took about six hours to do (originally I thought it would take 4 hours). In the past, I have been stranded in similar situations and forced to walk long distances because the bus was not running. I used my iPhone* and the Instagram photo-sharing application to take photos and video of the trek. Some of the creative inspirations for this project include documentary photographers such as Eugène Atget, Berenice Abbott and Robert Frank, the games for social change movement and notions of flâneurie ( wandering through urban spaces) or what in the digital age some call “phoneurie”. Being a phoneur or a post-modern flâneur arguably has a gamelike or questing quality to it, and I also consider @deadquarewalking a conceptual, urban mobile game – a location-based serious game at that. Urban, mobile games are not a new phenomenon. Some interesting examples include PacManhattan and Re:Activism. This leads to me asking a broader question of whether TrIP is indeed a collaborative, urban mobile game at its core – something worth pondering. Is public art inherently a game(s)…can games be art? Game designer Rod Humble has some insightful thoughts on game rules as art. 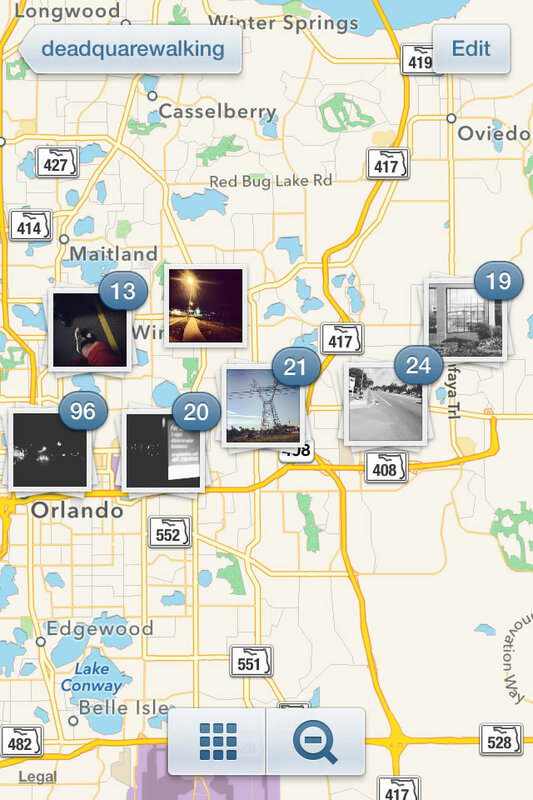 Instagram photo map of the bus routes I traveled via bus and walking. I mostly explored Links 104, 105 and 102. You can view the photographs and video that I posted on Instagram by searching @deadquarewalking. Some might find my destination/departure point (a gay club) trivial, but I think it is important to question how the LYNX bus system affects our entire livelihood not just our commute to work or what some deem “respectable” or “appropriate” destinations. Does a person without a car not have the right to desire human connection? To spend time with people or communities or cultures that they relate to and identify with? Or is that asking for too much? Being gay without a car in Orlando is definitely a conundrum. I would say it doesn’t help my dating life or my social life very much and has often made me feel disconnected from local, gay culture, which is an important part of my life for better or for worse. It can be lonely in this world to start with, it can be lonelier being a sexual minority and it can be even lonelier being a LYNX rider. Parliament House’s location on Orange Blossom Trail near Colonial Drive also particularly interested me. The urban terrain of these major roads as well as Alafaya Trail in the UCF area is not particularly hospitable to pedestrians, and I do not doubt are contributing factors to Orlando’s recent ranking by Transportation for America as the most dangerous city for pedestrians in the United States. Transportation for America specifically refers to Orlando and other cities like it as dangerous by design. I chose a walking trek because I thought it presented a creative opportunity to challenge and resist Orlando’s hostile design schema for pedestrians while also shedding light on aspects of the local bus system. What does the name mean? Quare what? “@deadquarewalking” is a play on the phrase “dead man walking” which has been used in the past to describe a prisoner condemned to death and alludes to the dangers of being a pedestrian in Orlando. However, I substituted the word “man” with the word “quare.” In Irish, “quare” can mean “very” or “extremely” or it can be a spelling of the rural or Southern pronunciation of the word “queer.” The word “queer” is an umbrella term for sexual and gender minorities and it often can have an activist context to it that questions binary or normative thinking. “Queer” was once used regularly as a slur but has been re-appropriated in more recent years by LGBTQ+ activists as a positive and inclusive term. Living in the American South, I personally relate more to the term “quare” versus “queer.” I feel like “queer” speaks more to the urban, LGBTQ+ cultures of the Northeast or the West Coast. Cultural theorist E. Patrick Johnson also argues for “quareness” as a way to question the subjective bias of whiteness in queer studies that risks discounting the lived experiences and material realities of people of color. Though I do not identify as a person of color and would be categorized as white, I think “quareness” has an important critical application for considering how the LYNX public bus system and Orlando’s overall walkability is intersectionally racialized, gendered and classed. I believe that there is definitely a tension with me using the word “quare” as a cisgender, gay, white, male graduate student that I think will create opportunities for more dialogue and reflection about how my specific social locations affect my performance of @deadquarewalking. In this post, I’ve included a collage of select photographs I took throughout my trek and three supplemental poems I wrote after the fact to express some of my feelings and thoughts about my experiences with @deadquarewalking. My ultimate goal is to design a prototype documentary computer game about my walking trek as a part of my MFA thesis project. I also plan to exhibit the photography and video I captured sometime in the future. I think it is important to note that as TrIP explores the accessibility of LYNX and other modes of transit in Orlando, there is also an overlap regarding telecommunications access and the usage of SmartPhones. Having a SmartPhone can significantly affect a rider’s ability to negotiate their experiences with the LYNX bus system. I found the iPhone to be an incredibly helpful navigation tool for planning my bus routes and my phone service also allowed me to upload photographs and video in real-time during my trek. The capability to do this requires a significant expense in terms of equipment and service charges that not all LYNX riders might have access to. I know that as a graduate student I continue to struggle to be able to afford the monthly charges for having a SmartPhone data plan with Verizon Wireless. Currently, my phone service is suspended so I would not have been able to accomplish @deadquarewalking today the way I did a month ago when my phone service was still active. Presently, I have limited use of my iPhone via access to WiFi hotspots. A collage of photographs documenting my bus rides and walking trek along Links 102,104 and 105 on October 31-November 1, 2013. All photographs and video were captured using either an iPhone 4S or iPad2 and were for the most part instantly uploaded to the photo-sharing application Instagram via @deadquarewalking. David Thomas Moran is a writer, documentary photographer, game designer and digital media artist. The subject of much of his creative work currently is public, street life, pedestrianism, the mobility of individuals and communities and urban/suburban design in the Greater Orlando metropolitan region.